Air Canada continues to expand the network of its low-cost subsidiary rouge with the planned resumption of service from Vancouver to Osaka, Japan in May-2015, which marks the first Asian market for rouge. rouge is also planning to take over Air Canada mainline fights from Toronto to Lima in Peru during 2015, which will be the low-cost airline’s first destination in Latin America. Meanwhile expansion of rouge's European network will continue in summer 2015 with the launch of services from Montreal to Venice. As rouge continues its expansion, the low-cost airline has appeared to have gained the support of mainline pilots, who once fiercely opposed rouge’s creation. Now that rouge has logged a year in operation, pilots believe the airline is an important part of Air Canada’s long-term viability. rouge marked its first anniversary in Jul-2014. Previously Air Canada has stated that rouge will operate 25 Airbus A319s and eight Boeing 767-300s by the end of 2014. During 2014 rouge expanded operations into western Canada, and now operates service from Vancouver to Las Vegas, Los Angeles and San Francisco and seasonal service from Vancouver to Anchorage. Seasonal flights from Vancouver to Palm Springs are scheduled to launch in Dec-2014. rouge also operates from Calgary to Las Vegas and Los Angeles. rouge will debut its first service to Asia in May-2015 with the launch of new seasonal flights from Vancouver to Osaka. Presently there is no service from Canada to Osaka, which is a hub for Air Canada’s Star Alliance partner All Nippon Airways (ANA). Air Canada operates flights from Toronto to Tokyo Haneda and from Calgary and Vancouver to Tokyo Narita. Osaka is an interesting selection for Air Canada rouge given that Japan’s economy is still weak, which is pressuring consumer spending. That could create obvious challenges in point of sale Japan. But given Vancouver’s large Asian population, and the lower operating cost of rouge, there is likely strong origin demand for the pairing, which rouge aims to serve five times per week. Expansion into Asia is a natural progression for rouge and its growing widebody fleet, which will reach 12 by the end of 2015. But the success of Osaka is tough to predict given Japan’s economic weakness. Vancouver’s economy outlook is fairly stable, and its employment rate is forecast to increase in 2014 and 2015. With rouge’s lower fares, the airline should be able to tap Vancouver’s large visiting friends and relatives market for the new service to Osaka. Air Canada revealed plans for the operation of rouge flights to Osaka as other North American airlines are planning to pull down capacity in Japan. Delta Air Lines, which has a much larger presence in the country, is restructuring its Asian operations and plans to cut its capacity 25% to 30% in intra-Asian operations as Tokyo Narita’s role as a connection point diminishes. rouge is also assuming Air Canada’s mainline flights from Toronto Pearson to Lima, Peru in May-2015. 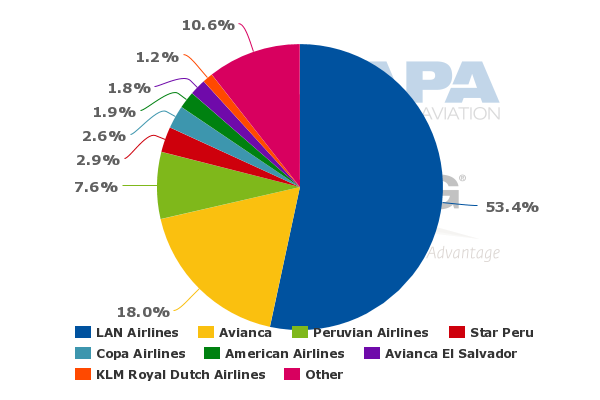 Air Canada’s Star Alliance partner Avianca is the second largest airline at Lima Jorge Chavez International Airport, holding an 18% seat share for the week of 20-Oct-2014 to 26-Oct-2014. Although Latin America is encountering economic weakness driven by sagging economies in Argentina and Venezuela, Peru’s GDP is forecast to grow 5.5% in 2014 and by 5.8% in 2015. 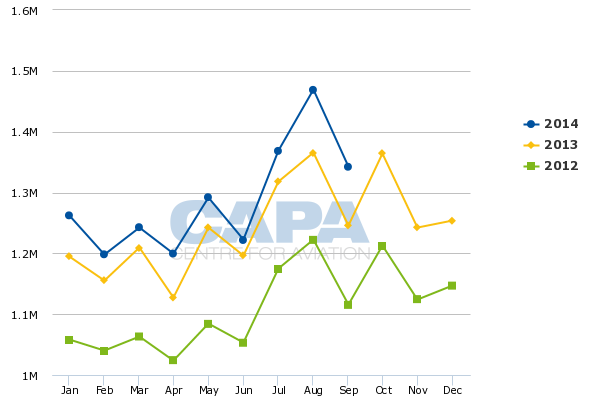 Lima recorded nearly 12% passenger growth in 2013 to approximately 15 million passengers, and has recorded steady passenger increases through Sep-2014. Presently Air Canada mainline operates three weekly flights from Toronto to Peru with Boeing 767-300s. 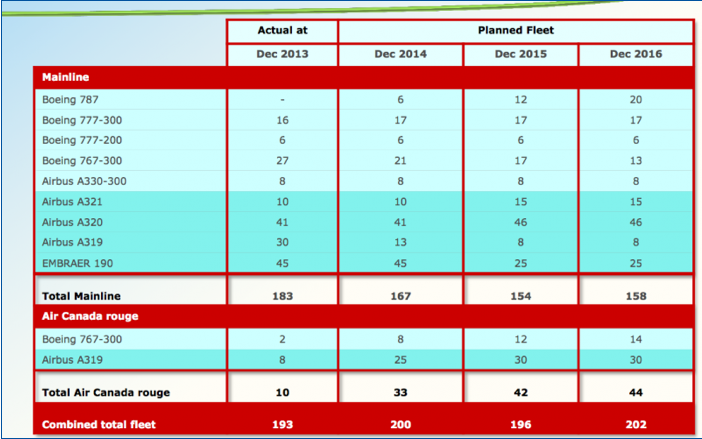 rouge will be operating the same aircraft type when it assumes the route. Air Canada repeatedly states that rouge offers lower seat mile cost than mainline – a 21% reduction on the A319 and 29% on the 767. Yields on the route are likely to remain the same once rouge assumes flights from Toronto to Lima, but the overall economics of the pairing should improve given the cost differential between rouge and Air Canada mainline. rouge is rounding out new service roll-outs in 2015 with service from Montreal to Venice in May-2015. As it launches new service to Venice, rouge also plans to operate a longer season in summer 2015 on its service to Athens, Barcelona, Lisbon, Manchester and Nice. It serves Athens and Barcelona from Toronto and Montreal and Lisbon, Manchester and Barcelona from Toronto. Schedules in CAPA and OAG show that Air Transat operated seasonal service from Montreal to Venice in summer 2014. As rouge was preparing for its debut, speculation mounted that the new low-cost airline could create pressure for Air Transat. In the summer 2014 time period, rouge and Air Transat competed on all of rouge’s trans-Atlantic flights from Toronto and Montreal with the exception of Toronto-Edinburgh. In Jul-2014 executives from Air Transat’s parent Transat remarked that industry capacity from Canada to Europe was up 10% year-on-year during the summer 2014 time period. But Air Transat executives had previously stated that pricing was holding steady in those markets. It seems that rouge and Air Transat co-existed in most of their overlapping markets even with the ample capacity increase in Canadian trans-Atlantic markets. One threat for both rouge and Air Transat is WestJet’s trans-Atlantic ambitions. WestJet has remarked that its new service from Toronto to Dublin via St Johns was a resounding success, and has hinted that more flights could be in the offing. WestJet’s presence in the trans-Atlantic was small in 2014 but will likely grow in 2015 and beyond. It is not clear if additional capacity from WestJet along with rouge’s continued expansion can be absorbed in the marketplace without diluting prices. Air Canada’s pilots appear to have softened their stance against rouge, which was a huge point of contention during contract negotiations in 2012. Ultimately, an arbitrator ruled in favour of Air Canada, and the contract that included the creation of rouge was imposed on the pilots. During 2012 the Air Canada Pilots Association remarked that the contract could cost pilots their jobs and undermine cultural change at the airline. Labour relations seem to be improving after Air Canada and union negotiators reached a tentative 10-year deal during Sep-2014 (which still needs ratification), and union leaders spoke positively about rouge. The head of the pilots association Craig Blandford told news outlet The Financial Post that one of the significant things the union has learned is that rouge is a “vital element to the prosperity, the success, the long-term viability of this airline [Air Canada]”. It is a dramatic change of opinion, and the improving labour relations should prove to be a key element as Air Canada continues to work towards transforming itself into an airline with sustained profitability. Despite the positive momentum rouge seems to be enjoying, some customer confusion about mainline offerings compared with rouge remains. Air Canada is working on a scheme to better educate passengers about the airlines and their differing product offerings. It is still too early to deem rouge a success. But for now it seems to be delivering on part of its mission, which is to lower Air Canada’s costs. On a unit basis, Air Canada’s costs declined 3.6% in 1H2014. Air Canada still has much work to do in creating a framework for sustained profitability. But early favourable results from rouge and improving labour relations are two important developments that increase the airline’s chances of transforming itself into a company better positioned to face increasing competition from WestJet and the proposed ULCC upstarts trying to exploit the Canadian marketplace.